What a great day in the Fort! I've been wordy before, but there are so many names and people to mention and thank, that I don't know where to start. I'll try to stay on task, though, and present this as more of a race report, although an entire book could easily be written about the efforts put into making Fort Collins first 25/50-mile event a major success. The race is the brainchild/demon-child of Nick Clark and Pete Stevenson, two of our finest runners here in Fort Collins. Between the two of them, they have already promoted trail running in a big way, not just through impressive race results, but even more by sharing their passion for running in the community in the form of social runs, fundraising events, non-profit races, unofficial races, and other running silliness. It's easier to be inspired to run with pillars like them in the community. With that*, Quad Rock was born, and Fort Collins had a tough new trail race to challenge all comers. (* - Surely glossing over many details and months of work on the part of getting the race off the ground). And in short order, both events for the race sold out. So, would it deliver? Undoubtedly, a key part of the race experience was the fabulous volunteers all throughout the race. Like all races, it wouldn't be possible without them. For local runners, it was even sweeter to see smiling and cheering friends along the course. A big thanks to everyone who volunteered in any part of the race. The rest of the race details were amazingly top-notch for an inaugural event, mostly because it was planned and executed by people very familiar with the best and worst of other races. The price was kept very reasonable (important), especially when meted out at an hourly rate; yet still provided an excellent PI tech shirt with Mary's artistic handiwork, full aid station support including individual EFS gel flasks; quality finisher's mugs; and an excellent post-race party with music, burgers (including veggie), and Pateros Creek beer. As for the course itself, the consensus was that it was very well-marked, with all major turns in both directions being incredibly obvious even for tired runners. In addition to many friends in town and along the front range, the race also attracted out-of-town racers from states like California, Texas, and South Dakota. As to the latter, we very much enjoyed hosting the trio of Andy Long (25M), Ryan Phillips (50M) and Chris Stores (50M) visiting us from Black Hills country. I'd previously met Chris during our training for the 2008 Colorado Marathon, and we've crossed paths several times since then, both in Colorado (Collegiate Peaks) and South Dakota (Lean Horse 50 and Lean Horse 100M), where I've also had the pleasure of meeting Ryan. 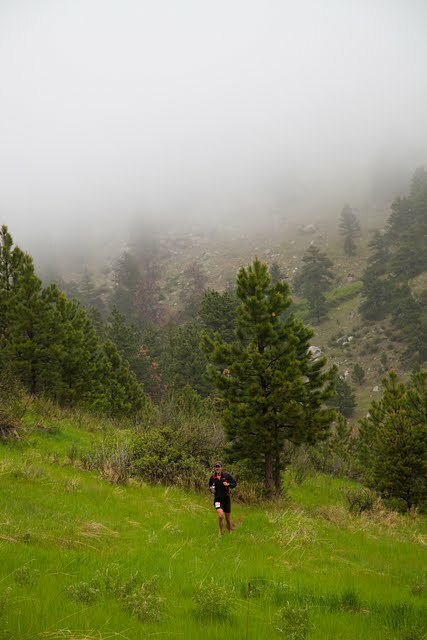 Chris and Ryan, in fact, are race directors for the Black Hills 100, which looks like an incredible race in a beautiful part of the country where I can't wait to return, once WS100 is done. Since all three were in town by Thursday afternoon, they also joined the FCTR group for the weekly social jog and pot-luck, bringing some tasty Crow Creek microbrew to the running rendezvous -- so they fit right in! As everyone was getting ready to run early on Saturday morning, our collective attention was turned towards the forecasted weather: unseasonably cool (30s-50s), overcast, with a chance of precipitation (possibly snow in the morning). It was a far cry from the more usual Colorado sunshine and the mid-80s we had seen the previous weekend, and it could either mean pleasantly cool running weather, or a cold, wet, muddy trudge. As planned, the race started at 5am sharp. The race begins on smooth singletrack in the valley, and I purposely held back here so as to avoid going out too fast, and settled into an almost-frustratingly slow pace in the early miles in a pack that was well behind the leaders, but it was a necessary discipline in contrast to my habits of starting out too fast. Fortunately, despite the rain earlier in the week, the ground wasn't wet enough to stimulate sticky mud that can plague the valley trails after the summer monsoonal rains. Now as the sun climbed above the horizon -- supposedly -- as did we, the course revealed itself only in small bits, as we climbed towards the infamous Towers Road. Once we reached Towers, the air was colder and significantly more humid than usual, but we had a surreal fog that shrouded the nascent Spring floral bloom. 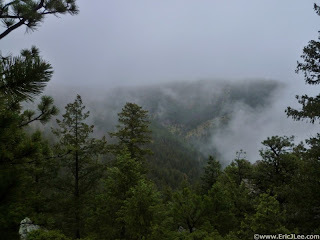 Runners that were just yards ahead would occasionally disappear around the corner and into the myst, and as we got higher, the breaks in the fog revealed valleys below that were preternaturally verdant from the rain earlier in the week. I ran nearly all of it, but kept my breathing controlled, to save myself for the descent. Seeing a familiar and beloved landscape in a completely different light was an unexpected relief from the taxing climb, and it was over with almost too quickly. Now our first technical descent began, down the Spring Creek trail. I've considered my technical downhill skills to be a noticeable weakness, but I've run this trail before, so why not get aggressive? Although it was early, and I probably got caught too far back in the Valley trails earlier, I actually caught up to a few runners on the downhill, when usually the opposite happens. Then, just before the Horsetooth Aid station, I caught up to friendly faces: Slush, Ryan, Alex, and Kyle. I was excited to chat with them a bit and see them running strong, and was buoyed even more by seeing Rob manning the aid station. With a quick water and gel fill, it was time to head up the familiar hill, hidden in the clouds. I watched Alex and Kyle pace off of each other and slowly pull away, and as they were both racing in the 25M, I knew that falling back even further behind them would be the most sensible plan. On the Rock trail, I enjoyed the well-known quarter-mile waypoints from previous workouts. By the upper reaches, we were treated to a fresh dusting of snow! Ryan and I reached Westridge together, and I told him to pound the downhills along with me because we would start some rolling uphills fast enough. And that we did. Alex was back in sight, giving a glimpse of what Western States pacing might look like, albeit with the day's temperatures being half as much as the reality of the canyons. Soon enough, we were at the socked-in Towers Aid. I breezed through, knowing I wouldn't be eating much on the Mill Creek descent. With Ryan in tow, we bombed down Mill Creek. The moisture had settled down some of the sand, so footing was actually pretty good. All the turns were well-marked, and we made it down to the Arthur's aid station. I took a quick and rare (but well-timed) restroom break here while volunteers filled my bottle and gel. Ryan went up ahead, and I was near Alex again. I hung near Alex on the climb up Timber, and I felt decent and actually ahead of pace but I think I was less chatty here and wondered if I should slow down, especially knowing that Alex was significantly ahead of his 4:30 goal. Oh, I should also mention that the entire race I had been taking EFS mocha gel. This is something I've never had before, and people talk about not doing anything new on race day, but this is the reality: the EFS gel was free, easy to carry, and calorie-dense. Carrying (and paying for!) a dozen or so gel packets at a time didn't sound attractive -- and I already have loathed the idea of gel packet garbage littering the earth (even if it makes it's way to a landfill), so I was willing to experiment with the EFS. My stomach was a bit unsettled early (could have been anything), but throughout the day, I'd have to say I was very pleased with the EFS. And so if I felt a bit low on energy, even if I wasn't hungry, I took a bit more of the EFS. I actually tried to take some every half hour, and use up the whole flask in a bit over an hour, meaning about 300 calories or so per hour (rough estimate and goal). I think I was earlier and more consistent on this than ever before. Anyway, we made it to the top of Timber and began the long, taunting descent back down to the turnaround. Alex and another 25M runner pulled away here, and eventually another caught up to me from behind. There's a strong temptation to race to the turnaround here, believe me -- I gave into that in a previous race and it (a.) never works and (b.) is entirely illogical (the halfway point is an arbitrary point, why speed up to hit it?) -- so I tried to stay controlled. But along the way, I was happy to see Burch in a commanding lead. I counted the rest of the folks, hitting around a dozen or so, and was pleased to see Ryan heading up and looking great. Alex finished a strong race almost 20 minutes (minute/mile) faster than his goal -- just in time to help me with my turnaround drop bag! I rolled in around 4:15, Marie and Victoria quickly helped me with food and water, and I traded my sweaty jacket and shirt for a dry one. With no thoughts of stopping the race after one loop, and renewed energy, I headed back up. I kept a steady pace up the switchbacks, and slowly gained on one runner, but another had left the aid station right after me and was gaining on me from behind. It turned out to be Paul Terranova from Austin, Texas. We didn't get to chat much, yet, though, as we were instead cheering on the parade of downhill runners. It was still reasonable for both directions to step to the side of the trail and get past each other, but overwhelmingly the downhill runners graciously yielded to us second-loopers. It was a great chance to see a bunch of smiling faces and see how friends were doing. Steph was looking good on her way to F2, but with one or two females ahead, I wasn't sure who was in the 25M option. Lots more runners coming through, and by the time the crowd had thinned out, we were done with the first climb of the second loop! What a fantastic psychological break. Now Paul and I had a chance to chat. He's got a full Slam of races this Summer and Fall, after some solid races like Bandera, and was enjoying the altitude training. His wife was running a fantastic race herself in the 25M. I really enjoyed Paul's company here, and I think the shared pace was mutually beneficial. It also kept my mind off of the next climb, which I considered the crux: the dreaded Mill Creek. We filled up on aid at Arthur's, and began our trek up. A nearby runner blew through without aid, and I think, later, regretted that decision. Now I've only done the Mill Creek climb a couple times in training (when running a single loop of the course), but I think it was helpful preparation for the ensuing brutality. Ironically, racing on the uphill in the second loop ended up being easier than training in a single loop. The difference? Shared suffering! Paul and I kept a steady tempo up the hill, and I knew enough about the short runnable hills with downhills lurking behind versus the steep ones that give way to even more steep climbing. And finally, the Mill Creek climb was done, which was a huge mental boost. We hit the aid station together again and headed off to roll along Westridge, before finally enjoying the first sustained descent down the Rock trail. I took the lead here through the rockier sections, counting down the quarter miles to the open section of service road, where I was anxious to let it fly. I got in a bit ahead of Paul here, but he caught up while I refilled at the aid station, and we high-fived a celebration of a well-earned downhill. His wife greeted him here and before I knew it he was getting ready to drink a PBR! He knew JT from days back in Texas and I can truly vouch that Paul was able to have a stellar run at a higher elevation and have fun at the same time. Meanwhile, Rob gave me the lowdown at the aid station and told me I was in 11th, something I had lost track of. Well, 10th is kind of a magic number, so I asked how the guys ahead were doing, and he said I was about 3 minutes back and might have a chance. I told him I was going for it. It's all arbitrary and worth keeping in perspective: within a few miles, it was likely that Burch and Co. would finish winning the race, while I'd still have an hour of running. But still, all games and goals are relative, so trying to aim for Top 10 sounded like a good goal. I was also on target for my goal of < 9 hours. Putting those together, my final goal was to run a strong enough race where I could actually run at a solid pace in the final miles, and not get passed. So, here at Mile 40, I was feeling as good as I was all day, and thought it would be fun to see if I could catch anyone. I began the Spring Creek climb at an eager run, but knew I also needed to save energy for the rest of the race, which was quite a bit of downhill, so I backed off and hiked just a bit when appropriate. We were almost out of climbing as Towers came into view, when I caught a brief flash of white jersey up ahead. I glanced at my watch and paced myself from that view: 1:30 back. If Rob was right, I gained a bit. And now for the wide-open descent down Towers. I hoped I saved enough quads for it, and felt fine. I caught a brief, far glimpse of white again, and at some point measured a split of 0:45 back, but he disappeared into the trees along the Stout trail after our fast descent. But there was a bit more ascent on Stout, and that's when I finally got closer. It was Ryan from South Dakota! It was great to see him again, and race somebody this late in the race, yet both happy to be almost done. We navigated up the last of the rocky ascent, before some technical descent, which I ran as hard as I could. I got a gap and was now alone again, but wondering I could hold a good pace on the smooth singletrack. Just as I started thinking that, with the most technical parts being done, I tripped on something -- actually, nothing, I tripped on perfectly smooth ground -- and got up as fast as I could to head down to the valley trails. In long views, I still saw Ryan, so I wanted to run as hard as I could and create a gap. I think he's a pretty stout runner and good company, and I also thought it would be cool to get as many Fort Collins runners in the Top 10 as possible (I think we got 3). I've never been able to hold on like that at the end of a race, so on a personal level, it was exhilarating. But mostly, my Mom asked how you can run for 9 hours and not get bored. Well, it's stuff like that to keep yourself occupied! I don't mean to be too dramatic, though -- we both ran a great race, and it's all made up anyway. Maybe it's silly and maybe he was being nice because he was staying at our house, who knows? So I had to keep moving. Mindy, Pete, and Lindsey were at the final aid station, with plenty of cowbell, and the finish line was in sight: I stayed steady and felt good, and then relaxed only a little bit in the last half mile, finishing in 8:49. First and second loop splits were within 15-20 minutes of each other, very happy with that. Alex was hanging out still and congratulated me -- he told me I was in 11th, by his count. And he's a math teacher! Well, it was a fun game while it lasted, so I shrugged and figured that's where I landed. Then I was unsure again after talking to Ryan, and didn't know for sure until the next day that Rob was right all along. And, Ryan finished right after me as first Master, solidly under 9 hours, and won a pair of shoes for his effort -- nice haul! He edged out "Swashbuckling" Slush, who ran a very solid race for 2nd Master's and was also rewarded handsomely for his effort. We caught up with Andy, who was dressed and warm, and before I got any beer, I decided to slowly walk to my car and change. The entire process took me 40 minutes! But I was much warmer with 2 jackets, a hat, gloves, and pants, and ready to try the Pateros Creek "51st Mile" beer, which was most excellent in the ceramic finisher's mug, and went well with a veggie burger and chips near the fire pit. Chris came in just after 11 hours, and well before his 12-hour training-for-Bighorn goal. After that, Brownie and Brandon came in, in that order but not far apart, with Brandon in a dizzy daze. I didn't get a chance to catch their full stories but look forward to the details. Everybody agreed that everything about the race was smooth...except for the rocky singletrack that made it a tough (but fair and well-marked) course. The volunteers were fantastic. Although it was a bit on the cool side, many people stuck around afterward to cheer on fellow runners and enjoy the party. As for me, I got out everything I wanted from it, and then some: a great race with great friends, old and new, on a familiar training ground. Thanks to everyone that made the first Quad Rock a big success! Very well done, Mike. Impressive second lap especially! And congrats on getting your pic taken at the finish with the neon jacket guys! Great run Mike! Sounds like you are on track for a good run at WS. Nice job, Mike! Congrats on finishing strong and running what sounds like a very smart race! You looked really strong when I saw you starting your second lap. Finishing under 9 hours is impressive for this course! You'll do great at WS, and you've got a great pacer (Alex)! Well, I'm about halfway through writing my own report, but now that you've got all the details fleshed out, I feel like I should just post my time and link to your report! Nice race and equally nice write-up! And, of course, many thanks for providing the SoDak crew with a place to crash for the weekend. WOO-HOO !!!! Nothing like a well run race ... well run. Race well run, my friend ! I had no doubt that you would "represent" on the home trails. Great race! Impressive finish, Mike, and not that far off the front runners. The weather was so iffy last weekend I changed my plans to not head up into the high country, but it was probably great for racing down here. Don't pull a Killian; make sure you have lots of water at WS. Heh. What a great race! I am excited to read what happens at WS. Great race, Mike! Off to WS! I'm a couple of posts behind, so congrats on the 2:50 marathon as well as this one!